Farnham Railway Station is a ten minute walk from the venue. Trains arrive and depart every 30 minutes. Claire Morgan's installations incorporate natural organisms and manmade materials. 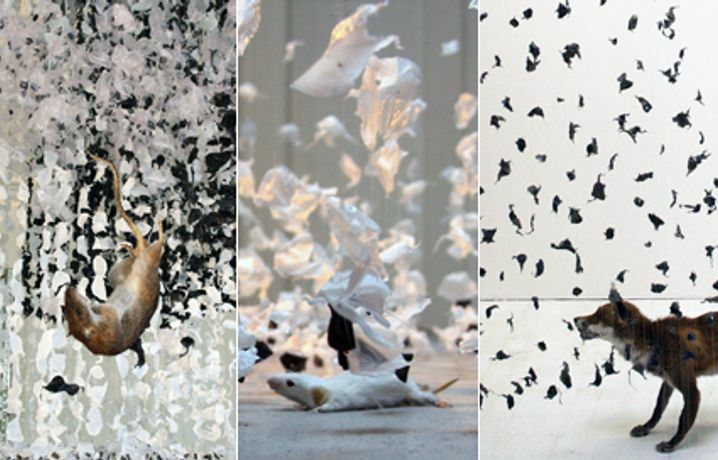 Insects, leaves, fruit and seeds, but also glass shards and torn bits of polythene are suspended in mid-air by their thousands, each entity attached to one thread. Large hanging structures are built up from fragmented and feather light units allowing multitudes of tiny modules to adopt environmental identities, which at times assume the shape of signs or words. In spite of their large scale and substantial appearance, however, these environments ooze frailty and bear out the mysterious correlation between death, decay and the persistence of life. More recently, taxidermic animals have been positioned within these structures, alluding to a disruption in the interaction between the natural and the manmade world, as if a moment of disturbance in the rhythm of nature is frozen in front of our eyes. While the greater part of the construction process occurs off site, the final installation of each work in situ remains a laborious and painstaking process. Recurring gestures play an intrinsic part in the cyclical exactitude which awards each work a crafted look, a deceptive air of permanence. Relying simultaneously on rational rigour and creative intuition the practice combines the complementary dualities of control and chaos. Claire's creative practice embodies the risk inherent in scientific experiment, aspiring towards calculated perfection while working against the constraints imposed by time, space and the material itself. The process offers a metaphor for the unpredictability of research, its dependence on the essential interplay between counteractive impulses: certainty and risk, permanence and change. It is this combination of contrasting forces that awards the work its creative tension and allows the fleeting moment to be captured, before all changes. This intimate connection between dualities presents a metaphor for the inescapability of evolutionary movement, allowing the viewer both to be involved and to remain outsider - participant and observer - in this unrelenting process. Glimpses into the mystery that shapes this voyage are offered as comfort, a mantra for dealing with an individual sense of impotence.